Although we’ve been accepting guest posts for a while at The HQ, I don’t think it would be an exaggeration to say that 2018 was the year of guest posts. One of the reasons I decided to begin prioritizing guest posts was because I knew I couldn’t cover every topic under the sun. 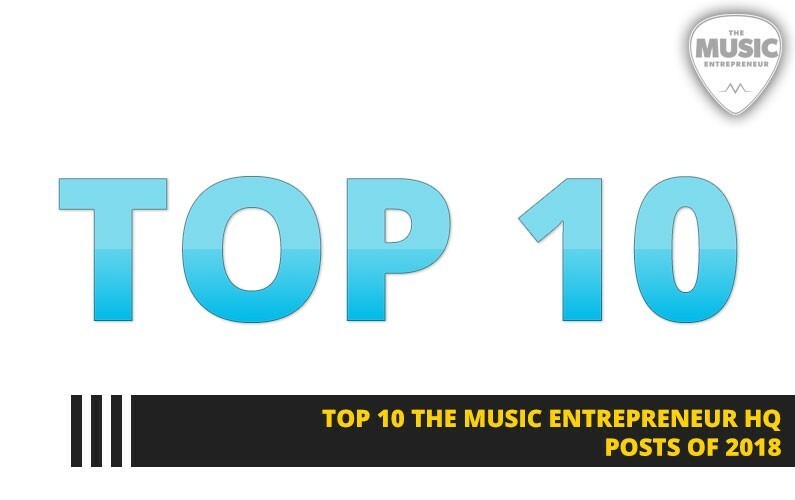 So, it was a way to tap into the expertise of other musicians and music entrepreneurs. And, the result is that we got plenty of outside perspectives on the industry and there were some that were especially valuable too. Unfortunately, pretty much everyone under the sun — from marketers to content agencies started contacting me about the opportunity to write guest posts. And, it was clear that most of them didn’t read our guidelines or even understand the concept behind The Music Entrepreneur HQ. Since I’m looking to build our brand around Confidence, Breakthrough and Fulfillment, it no longer makes any sense to accept low-quality guest posts that I end up spending all my time editing and formatting. Unless you’ve already contributed to The Music Entrepreneur HQ to this point, I will not be accepting guest posts from you in 2019. Another reason I felt it important to do this is because I’d like to simplify my efforts and continue to optimize the hundreds of value-adding posts we’ve already got. I’m not saying there won’t be plenty of new content too, but at this point I think it’s more important to put my energy into eliminating bottlenecks in my business. In any case, as I already mentioned, a lot of great content went live on the site in 2018. Here are the top 10 posts from 2018. The most popular post in 2018 was a guest post. I think Graham Aubrey picked a great topic — one that many are sure to be interested in right now. And, I’m glad he contributed, because there isn’t much I could say about how to succeed as a DJ. It’s not something I’ve ever done, though I have friends who have. With the popularity of EDM, I think being a DJ is also top of mind for a lot of people. Guest poster Pamela Brown put together this listicle for us. This is essentially a back to basics post featuring simple tips for beginner vocalists. But I’m sure there are plenty of vocalists out there that would find some value in this. If you’re interested in finding out how you can care for your voice and ensure that it’s always in ship shape, you should have a look at this list. I had a lot of fun putting together this post, because over the years, I’ve owned a lot of different pieces of guitar gear. This list features the best of the best. Honestly, there isn’t much I would change about any piece of gear on this list because they’ve all served me well. Music distribution services generally purport to distribute your music worldwide. In a general sense, this is true, but there are many that don’t reach every corner of the world. There is a huge listening audience in China, to the tune of 720 million people. So, if you’ve ever thought about getting your music into the hands of Chinese music fans, you’ll want to check out what Musicinfo has to offer. And, if you’re planning to use the service, use the promo code DAWESOME at checkout to get 10% off. That’s d-a-w-e-s-o-m-e.
Having played with it a little, I can honestly say that Drooble is a cool social network for musicians. I’ve often thought about adding this channel to my marketing efforts but haven’t had the bandwidth for it. Anyway, this episode of the podcast features an interview with Melina Krumova, Co-Founder & CEO of Drooble. Is there a specific service you’re looking for as a musician? Do you need someone to handle some aspect of your career, whether it’s design or PR? Then you’ll love this list. I spent time curating a lot of great resources for this blog post, and I’m planning to add many more in the future. Not sure which electric guitar to buy as a beginner? In this list, I share four options that are worth looking at. Now, you could always spend more and get something better than what’s on the list, but if you’re just getting started and you’re not sure whether you’re going to keep playing over the long haul, then you should look at buying a guitar made specifically for beginners. Written by Faisal, this guest post gets into all the essentials you need when you’re setting up a home studio. Based on the affordability of the gear as well as how easy it can be to record and make your own music from home, I think setting up a home studio is a great idea for many musicians. Nick Rubright of Dozmia is back with another great post about how to be the best band member you can possibly be. When playing in a band, it’s easy to see yourself as being the most important person. But it’s important to get out of your head and look at how you can add value to your band members. 10. What do I Bring to a Gig? Guest poster Perry Bowers offers some great insights into the equipment you should bring to each and every gig you play. Regardless of the gig, it’s always best to be prepared. You just never know what problems or technical difficulties you might encounter, and if you’re ready to deal with them, your gigs will go a lot smoother. What was your favorite post from 2018? Are there any topics we should be covering in more detail in 2019? Originally published at www.musicentrepreneurhq.com on January 23, 2019.